Established by the European Commission in 1993 through the Marine Science and Technology Programme (MAST), the Mediterranean Targeted Project (MTP I, 1993-1996) and the MTP II (1996-1999) represent a major effort in the understanding of the overall functioning of the Mediterranean Sea. The objective of the MTP II-MATER is to study and to quantify the triggering and controlling mechanisms of mass and energy transfer between the different compartments (land – sea, sea – atmosphere, water – sediment, living – non living, pelagos – benthos), in contrasting tropic environments (from eutrophic to oligotrophic) of the Mediterranean Sea and to investigate the ecosystem response to such a transfer. This programme is designed to assess the physical, biological and geochemical processes at various time and space scales, from the entire basin down to the local scale and from inter-annual variations to daily processes with the aim to forecast the global evolution. MTP II – MATER couples both experimental work and modelling. The project gathers 55 research groups from 13 EU Member States and 3 non-EU States. The Regional Data Centre for the Western Basin-IFREMER/SISMER archives the data and meta-data collected by French and Spanish cruises and the data collected in the Western Basin by ships belonging to other nationalities than France, Spain, Italy and Greece (FSIG). The Regional Data Centre for the Adriatic/Ionian Basin-OGS archives the data and meta-data collected by Italian cruises in the Adriatic Sea,Ionian Basin and Sicily Strait by ships belonging to other nationalities than FSIG. The Regional Data Centre for the Eastern Basin-HNODC archives the data and meta-data collected by Hellenic cruises in the Agean Sea, in the Levantine Sea and in the S.E. 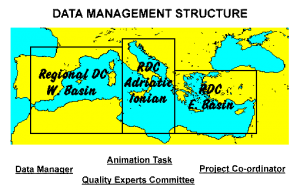 Ionian Basin by ships belonging to other nationalities than FSIG. An Animation Task to compile and update continuously the cruise schedule, publish it on the MATER server, make links to the regional centres catalogues and servers and to facilitate the access to the MADAM archives. The Data Management Structure is supervised by a data expert committee, the project co-ordinator and the data manager. SeaDataNet has developed an efficient distributed Marine Data Management Infrastructure for the management of large and diverse sets of data deriving from in situ and remote observation of the seas and oceans. Professional data centres, active in data collection, constitute a Pan-European network providing on-line integrated databases of standardized quality. The programme "International Oceanographic Data and Information Exchange" (IODE) of the "Intergovernmental Oceanographic Commission" (IOC) of UNESCO was established in 1961. Its purpose is to enhance marine research, exploitation and development, by facilitating the exchange of oceanographic data and information between participating Member States, and by meeting the needs of users for data and information products. The European Commission, represented for the purposes of this project by the Directorate-General for Maritime Affairs and Fisheries (DG MARE), has concluded service contracts for creating pilot components of the European Marine Observation and Data Network (EMODnet). The overall objective is to create pilots to migrate fragmented and inaccessible marine data into interoperable, continuous and publicly available data streams for complete maritime basins. The results will help to define processes, best technology and approximate costs of a final operational European Marine Observation and Data Network. The ODIP project is a Coordination and Support Action of the Research Infrastructures programme within EU FP7. The contract number is 312492. It has a duration of 36 months from 1st October 2012 till 31st September 2015. Ocean and marine data are recognised as valuable resources which have a high cost of acquisition and as such should be well managed and made as widely available to end users as possible for a variety of uses including scientific research, marine management and planning, policy and decision making, and economic activities. The information of this site is subject to a disclaimer, a copyright notice and rules related to personal data protection.